Medical guidelines for treatment of newly diagnosed non-small cell lung cancer (NSCLC) mandate upfront testing of tumor tissue for mutations in the EGFR gene (as well as ALK and ROS gene translocation). EGFR mutations are found in 10 to 15% of white patients, but in patients of East Asian origin such mutations are in encountered in approximately 48%. However, with new data and drugs entering the playing field, newly diagnosed patients’ treatment decisions could become more complex. The gist: Certain Asian patients with non-small cell lung cancer (NSCLC) have better survival results when treated with the drug afatinib (Gilotrif) than with standard chemotherapy. In a clinical trial, these results were true for patients whose tumors had a particular mutation called del19 EGFR. But patients with the Leu858Arg EGFR mutation did just as well on Gilotrif as on standard chemotherapy. 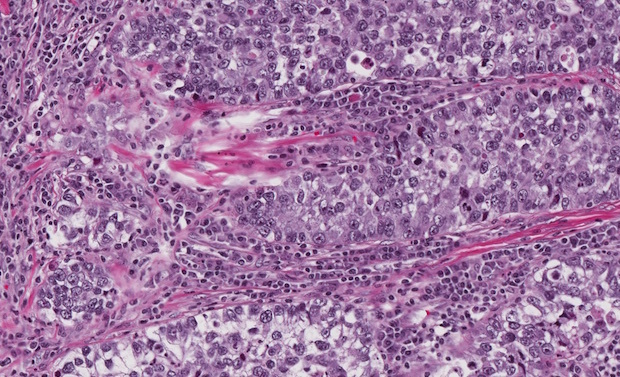 The gist: Asian people with non-small cell lung cancer (NSCLC) whose tumors have a common mutation in the EGFR gene called del19 might have better survival when treated with the drug afatinib instead of chemotherapy. That was the conclusion of a recent clinical trial that tested afatinib in volunteer patients. “Boehringer Ingelheim has reported positive data from a pre-specified subgroup-analysis of the pivotal Phase III LUX-Lung 3 trial of afatinib in Asian non-small cell lung cancer (NSCLC) patients. “The trial showed that these patients with the most common type of EGFR mutation, (exon 19 deletion; del19), lived significantly longer after receiving first-line treatment with afatinib compared to chemotherapy. “Guangdong Academy of Medical Sciences and Guangdong General Hospital vice-president and principal investigator of the LUX-Lung 6 trial Yi-Long Wu said: ‘Afatinib is the first treatment to demonstrate a significant overall survival benefit for NSCLC patients with the del19 mutation, the most common EGFR mutation. Editor’s note: This article discusses the results of a clinical trial that tested a targeted drug called afatinib (aka Giotrif, or Gilotrif) on volunteer patients with non-small cell lung cancer (NSCLC). The trial found that patients whose tumors had a particular mutation called del19 in the EGFR gene lived more than one year longer if treated with afatinib than if treated with chemotherapy. EGFR mutations and other mutations are detected via molecular testing, and can be used by oncologists to help develop personalized lung cancer treatment plans.